remember reading about twenty years ago that Andy had recorded very fast times over 10k and half marathon. Since we had never raced against each other, I assumed those courses were short! How wrong can you be? According to the age-graded tables, Andy is currently better than he has ever been and a major contender for British and International titles. He has seldom contested the Scottish Masters CC but won the M50 title in 2002, during a Glaswegian gale, well in front of Tom Scott and myself. In 2007 he secured M55 bronze behind George Sim and Tom Scott. 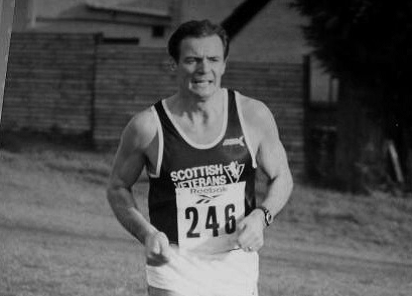 Then in 2012 he was victorious in the M60 race, after a close battle with eccentric, injury-prone but talented Alistair Murray from Aberdeen. Like Jane Waterhouse, he has run consistently well in the annual 5 Nations Masters International CC. Once again, I do not have all his results, but note that in 2002 he was 5th M50 and his Scottish team won silver medals. The M55 age group produced several very good runs: individual bronze in Belfast 2007 and a glorious team victory for Scotland (George Sim 2nd, Andy McLinden 3rd, Archie Jenkins 7th, Ewan Patterson 8th). Swansea 2008: 6th and team silver. Birmingham 2009: 4th and team bronze. Dublin 2010: 10th. By Glasgow 2011, Andy McLinden had improved once more to win an individual silver medal in his new M60 age group behind the almost superhuman Mike Hager of England. Andy repeated this fine achievement in Belfast 2012 and led his team to bronze medals. Andy writes that he ran all his best times as a veteran. He completed a marathon in 2.39 but reckons that, without the intervention of an unfortunate injury, he was capable of 2.30 at least. (At M55 he ran London in an excellent 2.46). His fastest half marathon was 69 minutes at Arbroath in 1993. He also recorded 15.20 for 5k and 32.20 for 10k. Looking back at his International cross-country performances, he reckons that, “like a fine wine”, he has matured into a medal-winner! He has won several Scottish titles on track as well as road and topped the British Masters rankings on a number of occasions. In 2011 he had a go at the European Masters half marathon in Thionville in France, winning a silver medal in the M60 category, and “catching (golden girl) Fiona Matheson on the line for a nice wee Scottish double”. He comments that his gold medal in Finland last year was “not bad for a fun runner”! Andy considers that the fact that he has never done a high mileage might be a factor in “getting away with it now”. Recovery has always been an important part of his training. Occupation: Clothing machine technician (28 years). Postman (last 10 years). How did you get involved in the sport? The marathon boom in the mid 80s. Have any individuals had a marked influence? Hugh Gibson had a big influence in my early years at the club and also gutsy Brian Campbell. What exactly do you get out of the sport? A feeling of well-being. Best performances? I had a head-to-head battle with the great Jim Dingwall in a 1500m at a track meet in Coatbridge and pipped him on the line before I realised who he was. However I suppose standing on the podium last year after winning the World Masters Half Marathon M60 title in Finland was the pinnacle. Worst? None really – I just enjoy racing. Unfulfilled ambitions? When you are over the 60 mark – just to keep going. Other leisure activities? None. Not much time for anything else. What does running bring you that you would not have wanted to miss? The competition and the friendship of my fellow athletes. Long Sunday run (15 to 18 miles); speed session Tuesday (400s or 800s); tempo run Thursday (four or five miles); easy runs or rest days in between.